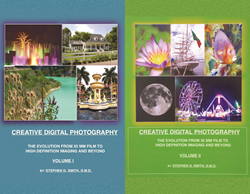 Infinity Publishing is Proud to Present New Books by Stephen D. Smith D.M.D Entitled Creative Digital Photography — Volumes 1 & 2. Infinity Publishing is proud to present new books by Stephen D. Smith D.M.D entitled Creative Digital Photography —The Evolution from 35mm Film to High Definition Imaging and Beyond Volume One and Creative Digital Photography — The Evolution from 35mm Film to High Definition Imaging and Beyond Volume Two. (Smith) offers digital camera seminars for those interested in learning more about digital cameras and photography. Dr. Stephen D. Smith is an expert photographer who has had his papers and photographs published in scientific journals, has lectured nationally and internationally, and offers clinics and lectures in photography. His first book covers the history of photography and the camera's evolution, video, studio portraiture, children and pet photography, and post-processing. The second book covers flower, landscape, horticulture, travel, the arts and historic places, medical/science/dental photography and food photography. His expertise is in 35mm cameras and he excels in digital format. On his website, he offers digital camera seminars for those interested in learning more about digital cameras and photography. Creative Digital Photography — The Evolution from 35mm Film to High Definition Imaging and Beyond Volume One and Creative Digital Photography — The Evolution from 35mm Film to High Definition Imaging and Beyond Volume Two are available in both trade paperback and hardbound editions on the Infinity Publishing website, Buy Books on the Web. ISBN: 9781495809606 Volume One, trade paperback, trim size 8.5" by 11", 208 pages, $36.95. ISBN: 9781495809590 Volume One, hardbound, trim size 8.5" by 11", 208 pages, $50.95. ISBN: 9781495809637 Volume Two, trade paperback, trim size 8.5" by 11", 142 pages, $27.95. ISBN: 9781495809590 Volume Two, hardbound, trim size 8.5" by 11", 142 pages, $40.95.